iPhone Software Development: How to re-codesign iPhone binary ? How to re-codesign iPhone binary ? The codesign certificate from Apple is used by developers to compile the source code and deploy their iPhone Apps to device. Have you ever think of how to re-codesign an already compiled iPhone binary and deploy that app to non-jailbroken iPhone without the source code and without re-compiling in Xcode ? That means only re-codesign the binary with the developer certificate again so that XCode can deploy it to development devices such as iPhone / iPod Touch. By using this method, you can patch the existing binary / add localization bundles or change the graphic files before re-codesign and deployment to device. For example, there was a very nice app called NetShare which was pulled from the App Store, sometimes ago. 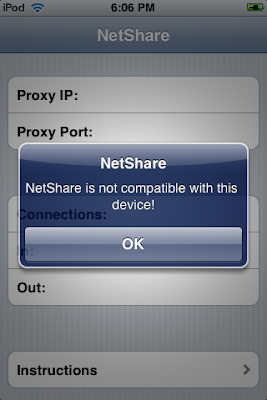 Would it be nice, if I can re-codesign (using the developer certificate) the NetShare binary and deploy it to my iPhone 3G, no jailbreak required. I can use it for tethering in cellular wireless. I have done it, and the developer certificate is used to change the codesign signature and the app can be installed to non-jailbroken iPhone / iPod Touch successfully. This requires a hack on the original ipa file downloaded from App Store. In my testing in iPhone 3G, Netshare can tether the 3G cellular networking using Mac OS X using the SOCKS Proxy. Safari Web Browing, iChat and iTunes work. But Microsoft Messenger and Mail do not work. To implement the re-codesign, you first need a decrypted ipa, there are lots of them out there in the net. Don't ask me to give you. Please take note that you don't need this method to decrypt the IPA file, if you already have the decrypted one downloaded from the net (those ipa files floating in the net are already decrypted). If you have that particular app installed in iPhone from AppStore directly, it needs to be decrypted in order to be useful. One of the decrypt methods is to use a jailbreak iPhone and run the script (source from pr0x.org Forum) below in iPhone to create the decrypted ipa. unzip -o CrappStore.zip -d "/Developer/Platforms/iPhoneOS.platform/Developer/Library/Xcode/Project Templates/Application/"
2) Create a new project from the CrappStore XCode Template with Project Name same as the decrypted ipa e.g. "Monkey Ball"
6) Click Build & Go to Device Release. Or alternatively, you can simply build and then drag the product to the device's app list. It is possible to have other methods, but using the Xcode is the easiest one. Moreover, you can patch / mod it before deployment to device. If you have modified the app, remember to delete the ipa file in the project folder, so that it will not be unzipped again and overwrite your modding. Could you upload the netshare re-codesign? Well, can you tell us how to do it so we don't have to reinvent the wheel? OK. I am finalising and will announce the method soon. wicked, this trick really work, thanks! If your binary does not work on codesign, probably it is the problem of your decrypted IPA. It must be from AppStore and decrypted using the stated method. Hmm. Have you deleted template file from Google Code? Yes, the template was removed. Any chance to get it back ? do i have to be a registred iphone developer to do this? You did a great work. But I search everywhere. but can't find it. Can you share it with me? I want to do research on it. If you send me a copy of crapstore.zip I will donate you. Works on SDK 4.0 with 3GS on iOS4.0.. continue guyz! Thanks for shaing it! I just bought a new iPad with 3.2.2 firmware, no way to jailbreak it, but now with this method i can install those crack app there. Thanks so much! Any way to install cracked apps without Provisioning Profile? I'm trying to sign a copy of PdaNet, but it says "codesign failed with exit code 1" and when trying to sign the .app file manually, it says "code object is not signed." Is there any way around this? I just want to tether without having to jailbreak. same here, xcode keeps telling "code object is not signed"